I’m writing this blog sat in a tent on the frozen Arctic Ocean at 78⁰46.4”N, 104⁰43.3”W, with just a meter and a half of frozen seawater between me and a 500m deep and very cold ocean. The temperature outside is -25⁰C today, which amazingly now feels almost warm after a week of camping out here in temperatures of -35⁰C to -44⁰C. Its blowing a gale today though and that makes it feel colder when out of the tents, -45⁰C wind chill factor, so just popping out still means covering every inch of skin up to stop frost bite and snow blowing in your face. As I sit in my tent writing this the wind is rattling the sides of the tent, the small jet-fuelled stove is struggling to keep the temperature in the tent above freezing and the generator is a constant drum in the background providing the only power we have out here. I’m here for my second year running as part of the Catlin Arctic Survey, a scientific expedition that combines a multidisciplinary team of international scientists with a group of Arctic explorers to enable us to undertake important climate change research in the High Arctic during the harsh winter-spring transition period. My role in the survey is to look at ocean acidification processes in the Arctic and its potential effects on the small pelagic marine animals called zooplankton that live under the sea ice. Ocean acidification is the other carbon dioxide problem associated with climate change. Our oceans absorb over a third of atmospheric carbon dioxide, so as atmospheric carbon dioxide levels increase our oceans are absorbing more carbon dioxide and as a result are becoming more acidic. Carbon dioxide dissolves into cold waters more readily and so our polar regions are going to be affected first, hence our urgent need to study these remote seas. The dominant zooplankton in the Arctic ocean are small crustaceans called copepods, and it is the potential impact of ocean acidification on these tiny but important creatures that is the focus of my time on the ice. Our window into the Arctic ocean beneath us is a metre square hole in the ice, through which we send all of our sampling kit, collecting information on the ocean’s physical and chemical properties, and collecting samples of the small plants (phytoplankton) and animals (zooplankton) that live beneath the ice and which support the larger marine animals of the Arctic food web. For me this means regular trawls using a plankton net, sending it down to 200m beneath the ice and then winching it back to the surface using our modified bicycle winch. I then take my samples back to the lab tent for hours of examining them down a microscope and counting out the copepods. I’m collecting data on what the zooplankton are doing at this time of the year, for which there is remarkably little data due to the harsh conditions, and relating their abundance and behaviour to the physical and chemical properties of the seawater. I’m also conducting incubation experiments, taking my copepods into the future by mimicking the warmer and more acidic seawater condition predicted for 100 years time and seeing how the copepods respond in terms of their physiology and behaviour. These experiments are extremely difficult to run in the freezing conditions, but we all pull together to come up with some ingenious solutions to every problem encountered, and work is progressing well. Whilst this is my second year of working in these extreme conditions, it was still tough for the first few days of getting used to the cold. We sleep in unheated tents, to escape the Arctic’s biggest killer – carbon monoxide poisoning. This meant climbing into a sleeping bag at -40⁰C on the first few nights, and second year round this still felt horrid. Even with two hot water bottles, three sleeping bags and some tactically placed chemical hand warmers (not just for hands), I was still cold for the entirety of my first night back on the ice. I don’t think you ever get used to waking up with snow on your face, but I soon settled back into to the Ice Base way of life. Food is fuel here, so meal times are the highlights of the day and large amounts of chocolate, together with the great team atmosphere we have out here, help keep you warm and your sprits high. Your metabolism goes through the roof at these temperatures and it’s amazing how much more we all eat out here. Whilst the Arctic is a tough and incredibly challenging place to do biological research, it is also a beautiful and hugely inspiring place to work. It’s a very dynamic place, and looks different every day according to the light and weather conditions. The snow on the ice is constantly moving depending on the wind, creating amazing shapes that constantly amaze us. It’s also a very humbling place to be, knowing that we are at the mercy of Mother Nature and that things can go wrong very quickly at these temperatures. Our only shelters are our tents, and a flight might take several days to get to us in any emergency. The contradiction between the power of the Arctic elements and its vulnerability to climate change impacts is striking and adds to its charisma. My time on the ice also reminds me of the beauty of the simple things in life. The luxuries we take for granted at home I am hardly missing, except for maybe a warm shower as it’s far too cold for a proper wash up here! I personally feel hugely privileged to be out here doing the science that I love and believe to be important in such a stunning environment. Posted by Dr Ceri Lewis, NERC Research Fellow (College of Life and Environmental Science). 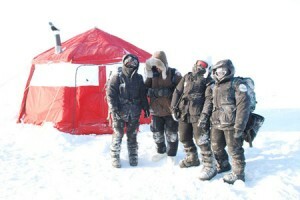 This entry was posted in research and tagged arctic, biology, bioscience, carbon dioxide, catlin arctic survey, ceri lewis, climate change, copepods, higher education, life and environmental sciences, NERC, research, science, snow, temperature on 15th Apr, 2011 by cnl201.